GOLD, 1225/30 could be the next target!? It want be easy for the golden bulls, but as I see it, they are aiming to 1225/30 as a next target, the possible strong resistance area. As you can see, the weekly MA100 is placed there and that level is previous resistance from March/April/May 2015. 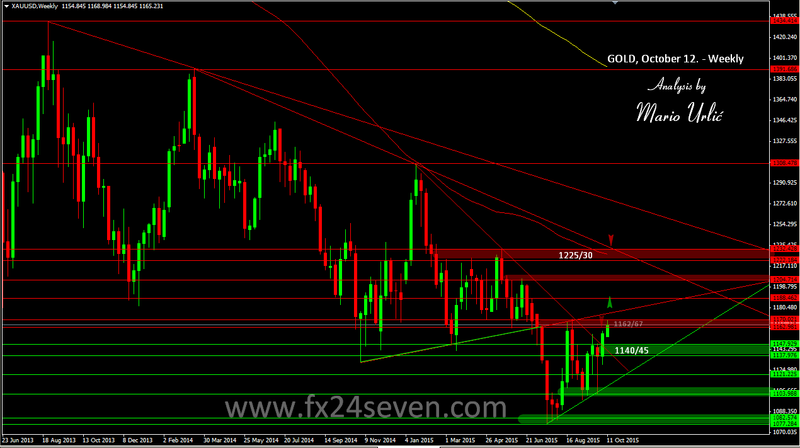 On the way up, the first resistance is reached, this level today 1167, which I pointed in my previous gold analysis. The shiny metal looks bullish and possible break of this level could lead the bulls to the next resistance area at 1175/80, the outer trendline which was the previous support. If the bulls manage that level, we could see the attack at 1205 > 1225/30 for sure. They look confident enough for now. On the way back, 1150 is first support, 1140/45 is the stronger one. This could be interesting to watch and to trade. Be aware that this is a weekly chart!